Summerhall is proud to present the Sun Ra Arkestra, live in the Dissection Room. 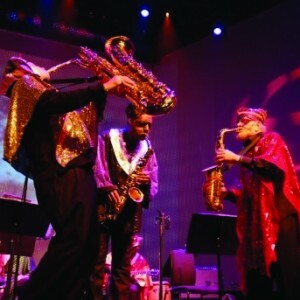 Led by legendary alto saxophonist and original member, Marshall Allan, the band move forward not as a repertory or ghost band, but as a spirit band, maintaining the discipline centred on the study, research and further development of Sun Ra precepts. Supporting is one of the most enigmatic and prolific songwriters working in the UK underground, Richard Youngs adds a touch of humanity to any project he’s involved with. The spirit of Sun Ra is alive and well!